Slowly Becoming Awake (N32) is a gorgeous book, beautifully printed & designed, presented in six colors. Lazer’s twenty-ninth book of poetry, and the sixth from his ongoing twelve-year Notebooks project, this is the first shape-writing book of his to include accompanying typed transcriptions. Readers have multiple ways to enter the meditative space of each poem/page. 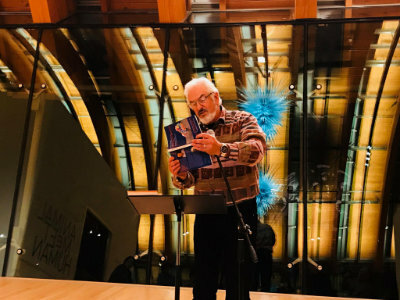 These poems can also be understood as scores for musical improvisations – thus far with a range of different instruments, including guitar, flute, percussion, soprano sax, cajón, theremin, and bass, as well as various multi-voice arrangements. Poem, visual art, improvised compositions, calligraphy, the unfolding of intervals of consciousness rolled into one. Dedicated to poet/Zen priest Norman Fischer, Slowly Becoming Awake incorporates readings in the 13th century Soto Zen founder Dogen’s Treasury of the True Dharma Eye. The book takes us through Lazer’s serious illness (June-July 2016) through his recovery and into his increasing meditative writing time spent at a remote farm in rural Alabama. Hank Lazer has published twenty-nine books of poetry, including Evidence of Being Here: Beginning in Havana (N27) (2018, Negative Capability Press), Thinking in Jewish (N20) (2017, Lavender Ink), Poems Hidden in Plain View (2016, in English and in French), Brush Mind: At Hand (GreencupBooks, 2016), N24 (Little Red Leaves / Textile Series, 2014), N18 (complete) (Singing Horse Press, 2012), Portions (Lavender Ink, 2009), The New Spirit (Singing Horse, 2005), Elegies & Vacations (Salt, 2004), and Days (Lavender Ink, 2002). Selected Poems and Essays of Hank Lazer, completed by a group of translators and with a Preface by Nie Zhenzao, was published by Central China Normal University Press in 2015. Lazer’s Selected Poems have also been published in Italy (Pensando Cantando: Poesie Scelte di Hank Lazer, QuiEdit, 2015, translated by Anny Ballardini) and will be appearing shortly in Cuba (Pensando Cantando, Torre de letras, translated by Omar Pérez). In 2011, in collaboration with visual artists from the Taller Experimental de Gráfica in Havana and the University of Alabama’s Book Arts program, Lazer published Indivisible, a fine press bilingual edition of handwritten shape poems. Pages from the notebooks have been performed with soprano saxophonist Andrew Raffo Dewar, including performances at the University of Georgia (November 2013) and in Havana, Cuba (two concerts in January 2014), and most recently with legendary Birmingham improvisational guitarist Davey Williams. Over the past fifteen years, Lazer has collaborated with various jazz musicians, filmmakers, choreographers, and visual artists in seeking new ways to present poetry. In April 2015, Lazer was selected for the state of Alabama’s highest literary award, the Harper Lee Award, for a lifetime of achievement in literature. Forthcoming: Poems That Look Just Like Poems (2019, PURH – one volume in English, one in French) and a long essay on “grace” to appear in Religion & Literature. Lazer’s books of criticism include Opposing Poetries (two volumes, 1996) and Lyric & Spirit: Selected Essays 1996-2008 (2008). Audio and video recordings of Lazer’s poetry and an interview for Art International Radio can be found at Lazer’s PennSound website: http://writing.upenn.edu/pennsound/x/Lazer.html , as well as in special issues of Plume #34 and Talisman #42, and spacecraft #10. With co-editor Charles Bernstein, Lazer edits the Modern and Contemporary Poetics Series for the University of Alabama Press. To date, the MCP Series has published over 50 books, including work by Marjorie Perloff, Harryette Mullen, Jerome Rothenberg, Rachel Blau DuPlessis, and Brian Reed. In January 2014, Lazer retired from the University of Alabama (where he continues to teach innovative seminars for New College, the Blount Scholars Program, and Honors College) after 37 years in a variety of positions, including Associate Provost for Academic Affairs, Executive Director of Creative Campus, and Professor of English. Lazer also convenes a weekly Zen meditation group in Tuscaloosa. Lazer can be reached at hlazer@bama.ua.edu.